Thomas Negovan will be marking the release of his latest album By Popular Demand with two intimate performances in Chicago and Los Angeles. On Friday the 13th, Century Guild plays host for the first performance, while legendary lowbrow gallery La Luz De Jesus serves as the performance space for the second show in Los Angeles, CA. DOORS: 7p.m. | PERFORMANCE: 8p.m. Bypassing electronic and digital media for a completely analog musical experience, the single from Thomas Negovan’s debut solo album By Popular Demand is the first new song recorded AND released on wax cylinder since 1914. 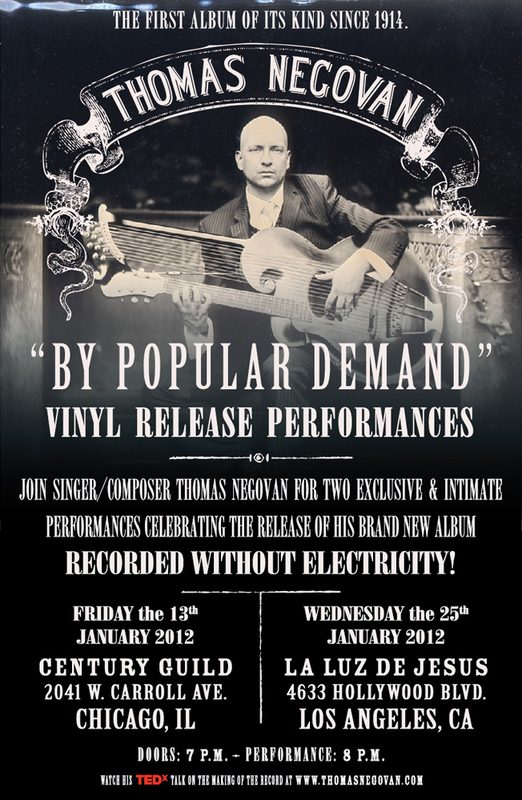 Thomas Negovan’s debut solo album By Popular Demand features eight songs recorded entirely without electricity onto wax cylinder using a 1900’s Thomas Edison Phonograph Recorder and will be released in a limited number of vinyl-only editions, available at the concert.